The NCAA Tournament moves on to the Sweet 16 — Thursday and Friday — with every No. 1, 2, and 3-seed remaining. With the exception of No. 12-seed Oregon (though they beat a 13-seed in the second round), it’s been a very “chalky” tournament to this point. And that’s not exactly surprising, with the clear gap between this year’s top teams and the rest of the field. For example, the top-14 teams in the Ken Pomeroy (KenPom) College Basketball Ratings all remain in the tournament. So, every Sweet 16 game on the surface is very good. You could rank these eight games in all sorts of ways, with all sorts of criteria. By how good the teams are. By how fun the teams are. How competitive the game should be. The star appeal (in Duke’s case, especially). We’ll consider all of that and more as we take a stab at ranking the eight games. After becoming the first No. 1 seed to lose to a No. 16 in 2018, Virginia (31-3) followed it up by trailing by six points to No. 16-seed Gardner-Webb after one half in the first round this year. But the Cavaliers turned it around in the second half to win by 15 points, and then beat No. 9-seed Oklahoma by 12 points in the second round (Oklahoma blew out No. 8-seed Mississippi 95-72 in the first round). Virginia is quite possibly the best team in the country, and after a sluggish start (they were likely pressing following last year’s disaster), they’re now playing like it. Oregon (25-12) dominated their first two games, with a 72-54 victory over No. 5-seed Wisconsin and a 73-54 victory over No. 13-seed UC-Irvine. Their frontcourt is particularly exciting, with Kenny Wooten emphatically rejecting shots like crazy (11 blocks!) so far in the tournament. Ultimately, Virginia’s star trio of De’Andre Hunter, Kyle Guy, and Ty Jerome will probably be too much for Oregon. Of course, if Oregon is able to pull off the upset, this would probably end up being the best game of the Sweet 16. Putting this game seventh only speaks to how good the other six games are on the surface. Gonzaga (32-3) went 16-0 in WCC play, before losing in the conference tournament to St. Mary’s. But they didn’t just beat up on a weak conference. For example, hey took down Duke in the Maui Invitational. This team is a true powerhouse and one of the favorites to win the whole tournament. But Florida State (29-7) has played like a powerhouse themselves in recent weeks. Since March 5, the Seminoles have two wins over Virginia Tech and one win over Virginia, as well as a 90-62 victory over Ja Morant and Murray State in the second round. Sophomore forward Mfiondu Kabengele has come up big for Florida State lately, with 21 points in the first round and and 22 points in the second round. We may have this one a little higher if not for the uncertainty of Kentucky forward P.J. Washington’s health status. If he indeed plays, Kentucky (29-6) is much more dangerous. The sophomore is averaging 14.8 points and 7.5 rebounds per game this season, both team-highs. But without Washington, Kentucky was still able to take down No. 7-seed Wofford 62-56 in the second round. While Kentucky is favored, many people will pick Houston (33-3) in this game (especially if Washington can’t go). Houston’s only losses this season are at Temple, vs. a UCF team that almost just beat Duke, and vs. Cincinnati. And they just walloped No. 11-seed Ohio State 74-59 in the second round. Michigan State (30-6) probably should’ve been a 1-seed, while LSU (28-6) probably should’ve been a 4-seed. The Spartans pummeled Minnesota 70-50 in the second round. They rank top-9 in the country on KenPom both offensively (4th) and defensively (9th). They have an All-American and the Big Ten Player of the Year in point guard Cassius Winston. And they have a tourney-tested head coach Tom Izzo (he’s been to seven Final Fours). LSU has a very talented backcourt, with three guards averaging at least 11 points per game: Tremont Waters (15.0), Skylar Mays (13.6), and Javonte Smart (11.4). They also have a potential top-20 NBA draft pick in 19-year-old big man Naz Reid. This game gets a boost because of the Zion factor. Everybody wants to watch the best player in the country and upcoming No. 1 overall NBA draft pick who has otherworldly athleticism out of a 6’7″, 285-pound frame. And along with Williamson, Duke has two more potential top-five draft picks in R.J. Barrett and Cam Reddish. There’s more intrigued added when you consider that Duke lost to this Virginia Tech team 77-72 without Zion in February. 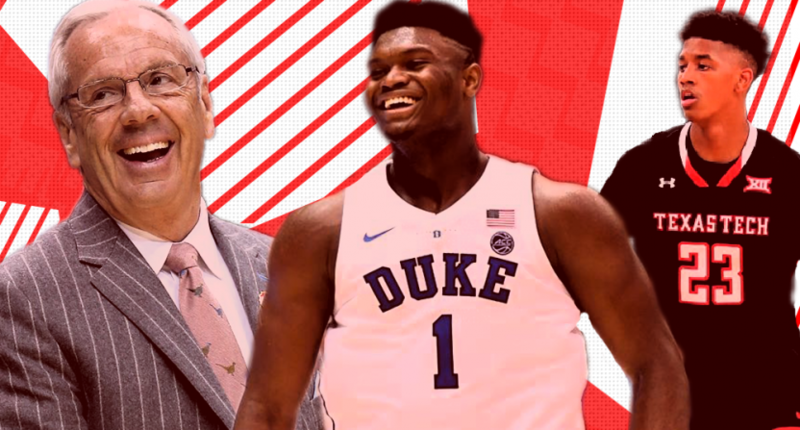 Can the Hokies pull off the upset again, with Zion involved this time? It’s unlikely, but Duke *barely* survived vs. a worse team than Virginia Tech in the second round (UCF). This is about as coin-flippy as games will get in the NCAA Tournament. Tennessee (31-5) and Purdue (25-9) rank consecutively inside the KenPom top-10. But for Purdue to win, they probably need star guard Carsen Edwards (averaging 23.6 ppg) to go off. That was certainly the case in the previous two rounds: Edwards scored 26 points vs Old Dominion and 42 points vs Villanova. When he’s locked in, he’s as entertaining as anybody in the country. Tennessee has plenty of firepower (five players averaging at least 10.5 ppg), led by Grant Williams (18.0 ppg, 7.5 rpg) and Admiral Schofield (16.4 ppg, 6.1 rpg). Okay, so what we said about Purdue-Tennessee being about as coin-flippy as NCAA Tournament games get? The same goes for Michigan-Texas Tech! As you see above, Bovada and Five Thirty Eight even disagree on who should be favored. That’s how close it is on paper. These teams rank No. 1 (Texas Tech) and 2 (Michigan) on KenPom’s defense rankings. To the casual basketball fan, seeing “Texas Tech” doesn’t scream excitement. But they have a player that could be a top-three draft pick this year in Jarrett Culver, and he’s shown why he’s such a highly-regarded prospect with his performance so far in the tournament. Texas Tech (28-6) probably needs Culver to bring such a performance against a terrific Michigan (30-6) team. There’s blowout potential here with how good North Carolina is, but odds are it’s a pretty close and highly entertaining basketball game. North Carolina (29-6) is a popular national championship pick, for good reason. The Tar Heels annihilated No. 9-seed Washington 81-59 in the second round. They mix veterans, led by seniors Cameron Jordan and Luke Maye, with tremendous young talent such as freshman Coby White. But Auburn (28-9) is red-hot at the time you want to be red-hot. The Tigers have 10-straight wins (though they almost slipped up vs New Mexico State in the first round), with two victories against Tennessee and most recently a 14-point victory over Kansas among those wins. Auburn has a backcourt capable of taking over games in Bryce Brown (25 points vs Kansas) and Jared Harper (18 points vs Kansas, 17 points vs New Mexico State).